The choice of transmission waveform controls the frequency content of the transmitted signal. The depth of penetration and resolution is determined by the frequency content. The relationship between depth of penetration of a low frequency electromagnetic signal and frequency and conductivity is described by the skin depth equation. The skin depth (See equation 1) is the effective depth of penetration of electromagnetic energy in a conducting medium when the amplitude of a plane wave in a whole space has been attenuated to (or 37 percent) (Sheriff, 2002). 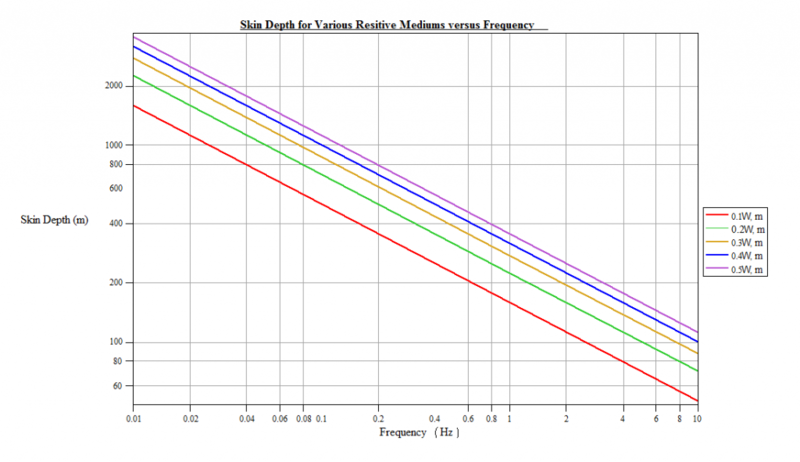 The skin depth equation provides the depth of penetration in isotropic conductive whole-space. The skin depth provides a rough estimate of electromagnetic field penetration in complex geo-electrical environments due to the presence of several high contrast boundaries (i.e., air-water, water-sediment and sediment-hydrocarbon boundaries). Sea water is generally considered highly conductive and acts as a low pass filter to incident MT source fields (Constable et al., 1998). Frequency also affects the depth of penetration because energy is lost for every cycle of the wave, causing higher frequencies to be attenuated more, as seen in 1. The electromagnetic skin depth is shortest at high frequencies. Figure 1: The relationship of skin depth for frequency and conductivity. The skin depth decreases as the conductivity or frequency increases. 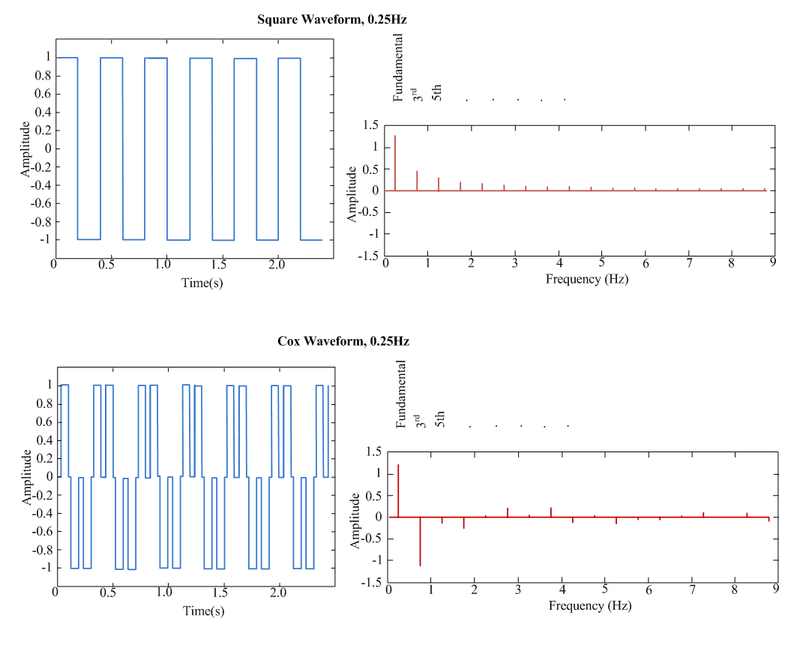 Figure 2: Typical transmitted MCSEM waveforms and the associated frequency spectra. The frequency spectrums are usually dominated by the fundamental frequency and its harmonics. Waveforms with both low and high frequencies allow both near surface and target geoelectric properties to be resolved (Modified from MacGregor, 2006). MCSEM waveforms are usually variants of the 100 % duty cycle waveform. The square wave contains fundamental frequencies (and odd harmonics) typically within the range of 0.01-10 Hz (Pound, 2007). Myer et al. (2011) have overviewed a number of binary waveform classes (alternating polarity between positive and negative output current). Myer et al. (2011) overview the types of waveform classes including asymmetric, doubly symmetric, singly symmetric (rotationally), doubly symmetric and singly symmetric. The depth of investigation is limited to waveform frequency content. Higher waveform frequencies attenuate more rapidly and are limited to sensing shallower structures. A good transmission waveform choice resolves both shallow, target and deep subsurface geo-electrical properties, whilst being compact, reduces polarizing effects and has a stable controlled phase. As a result, there has been a transition from simple singly symmetric square waves to binary and ternary waveforms such as the doubly symmetric “Cox” (Constable and Cox, 1996) waveform because of the controlled phase reducing polarizing properties (see Figure 2). The waveforms remain low frequency variants of the square waveform despite the transition to more complex waveforms. Waveform monitoring is routinely used for stable and consistent signal phase measurements to ensure waveform stability (MacGregor, 2006). The depth of investigation, resolution and sensitivity to the hydrocarbon body is influenced by the frequency content overall. Constable, S. and C. S. Cox (1996). Marine controlled-source electromagnetic sounding 2. the pegasus experiment. J. Geophys. Res. 101 (B3), 5519–5530. Myer, D., S. Constable, and K. Key (2011). Broad-band waveforms and robust processing for marine csem surveys. Geophysical Journal International 184 (2), 689–698. Sheriff, R. (2002). Encyclopedic Dictionary of Applied Geophysics. Society of Exploration Geophysicists.